Review originally published on acreads.blogspot.com! This review will contain spoilers... Read at your own risk! So, remember that whole I'm going to chunk this book up in chapter sections and read it slowwwly so that I don't finish before the rest of my book club does? Yeah, me too and I pushed that idea right out the window. Because I loved this book. Loved, loved, loved it. After chapter 4 or 5, I couldn't stop myself from tearing into it. But let's not get ahead of ourselves. What is this book about? Well, at its core The Goddess Test is a Persephone tale. In this version, Hades/Henry (referred to as Henry for the rest of this review) has been searching for his next queen after his wife, Persephone, chose death after the mortal man that she fell in love with died. For whatever reason, Henry chooses likely candidates from the mortal women who he encounters - apparently the immortal women are not good enough. After agreeing to spend the fall and winter with Henry, each woman is subjected to a series of tests to make sure that she is good enough to fill Persephone's shoes and live among the gods for the rest of eternity. However, none of the women make it past Christmas - each one has turned up dead, mysteriously murdered despite all of the protection lengths Henry has gone to. And this has continued, century after century, until Henry decides that he'll give one last woman a shot before abdicating his right to rule the Underworld. Enter Kate Winters. Kate is not your typical 19 year old girl. Instead of spending her youth as any other girl her age would, Kate has spent the better part of four years caring for her terminally ill mother. At the beginning of the story, Kate finds herself uprooting her life and her mom to Eden, Michigan - a seriously small town that offers nothing except the fulfillment of her mother's last wish - to die peacefully at home. After a series of events (that I discuss here and here), Kate meets Henry and agrees to undergo the goddess tests over the course of the next six months. I won't give away anymore of the plot... You'll have to read it yourself to find out whether or not Kate survives the goddess tests! Like I said, I loved it. First of all, I won't say that I love Greek mythology in YA, but I definitely enjoy it... and who doesn't like a good Persephone tale? I liked the angle that Aimee Carter took on the classic myth. Persephone wasn't Henry's slave or prisoner... and Henry was not and is not a horrible guy. Quite the opposite. Rather, they entered an arranged marriage with the hopes that they would grow to love each other but Persephone simply fell in love with another man... and Henry let her go because of what a good guy he is. So often I've seen Hades cast as such a horrible and malevolent character - practically chaining Persephone to him during the winter months so she couldn't escape. It was refreshing to see a new take on the tale and to actually want to root for Henry and kind of hate Persephone for what she did to him. All in all, this story arc worked. The world building was interesting. Most of the story took place inside Henry's manor in Eden, MI - sort of a... half way place between the living, mortal world and the Underworld. I couldn't get an exact feel for how big the manor was... but I usually pictured the castle from Disney's Beauty and the Beast and that worked for me. But the world is complex. We're seeing the story unfold from Kate's perspective - a young human girl dumped into the magnitude of the Underworld and after life. We see snippets of things and are given a few moments of clarity but for the most part, the world that Kate finds herself in is simply too complex and layered to fully understand in single novel. Lucky for us, Kate and Henry's relationship continues on after The Goddess Test. The characters were also very complex and interesting. Kate Winters stands apart from the typical teenage heroines of the YA genre. She has given up her life to care for her mother and yet has moments of absolute selfishness. 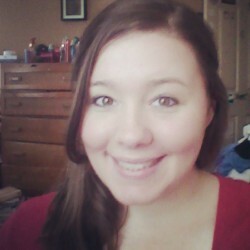 It was hard to pin her down and say, "This is who Kate Winters is," because she was constantly growing and changing and learning. And although the slight inconsistencies in her character was frustrating and a bit off putting at first, I grew to appreciate it. Who likes a static character, anyway? Half of the journey is adapting to new situations and Kate was definitely put to the test. And Henry... Ohhh, yeah. Like Kate, Henry also stands by himself when compared to the Edward Cullens of YA. Henry has an eternity of emotional baggage to sort through and isn't miraculously healed of it when Kate Winters enters the picture and I really appreciated this. He is still reeling from his feelings towards Persephone and not to mention the centuries worth of dead young women who have died because of their connection to him. That isn't to say that Henry is a total recluse (we are definitely given some amazing moments between Henry and Kate), but he too has to work through everything that he has gone through before he is able to face what could exist with Kate. So, 4.5/5 stars. I loved it and I will be reading the next two (three?) in the series... but it wasn't quite a favorite for me - I'm not sure why. 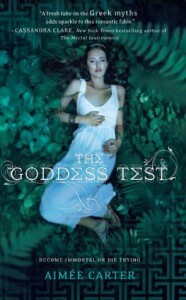 If you're into Greek mythology or just a really good, unique love story... please give The Goddess Test by Aimee Carter a shot. I really think you'll enjoy it!